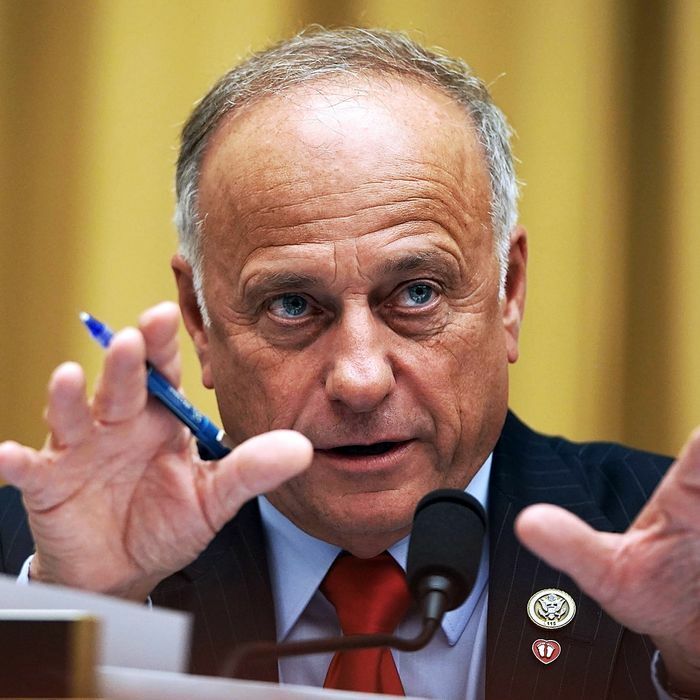 Not a single thing has changed about King’s views on race, culture, or immigration since November 5, nor was there any ambiguity about where he stood beforehand, during his five years representing Iowa’s Fourth District in the House of Representatives, or the ten years before that representing the now-obsolete Fifth District. The only change is King’s decision to explicitly associate himself with white supremacy. The material impact of this cosmetic shift is nonexistent as far as his actual beliefs and policy mandates go. Grassley and his fellow Republicans have not just given the congressman a belated rebuke. They have created a road map for other racist Republican politicians to follow in the future. To the extent that the sudden GOP backlash to King’s comments can be understood as setting a precedent, it is that Republican elected officials will uniformly tolerate, and even endorse, those who espouse flagrant racism in their ranks as long as its proponents do not self-identify as racists. None of these statements, actions, or affiliations proved troubling enough for congressional Republicans to rebuke until this month. It didn’t matter that years of documented behavior demonstrated King to have views that could only accurately be described as “white supremacist” or “white nationalist.” All that mattered was whether he had self-applied the labels. The current political moment is marked by such phenomena as candidates winning office in part by threatening to use their trucks to round up “illegals” and deport them. This week’s clarification of standards will no doubt prove invaluable for other Republican bigots seeking to ascertain how far they can push the envelope before their colleagues rebuke them. Whether the views themselves are untenable from a political standpoint is another question. Indeed, they generally have proven not to be. As The Atlantic’s Adam Serwer has observed, there is scant daylight between King and the GOP’s avatar in the White House, Donald Trump. The president’s obsession with getting a U.S.–Mexico border wall built — which has since precipitated the longest government shutdown on record — was inspired, in part, by King’s own years-long wall fixation. Then there is the fact that King keeps getting reelected by his Iowa constituents. “King doesn’t create the same headlines [here] that he does nationally,” wrote Scholten, King’s 2018 Democratic challenger, by way of explaining this in a USA Today opinion column. “Some of the national headlines break through. But for the most part, if you are a farmer on your combine listening to talk radio and getting reports about record low soybean prices, your congressman meeting with neo-Nazis or tweeting in support of a Toronto mayoral candidate who is a white nationalist just seems far away from day-to-day life.” This may be accurate, but such ignorance — willful or otherwise — grows less convincing as an excuse the higher one climbs the Republican political ladder. Everyone in Congress knew about King’s views for years. They also knew they had a man who kept winning on their behalf. His political longevity illustrates vividly how racism has maintained its particular foothold in the Republican Party: it has helped the party survive. But King’s longevity also reflects an impoverished understanding of racism common among Americans of all political stripes. CNN anchor Anderson Cooper provided a recent illustration of this when he asked incredulously, “How can you say that?” when Representative Alexandria Ocasio-Cortez said she saw Trump as a racist. For many Americans, in order to be classified as a racist, a person must claim the label proudly and express their beliefs in the form of public vitriol, slurs, or physical violence. Absent that, beliefs and actions that are materially racist cannot be labeled as such. For Republican elected officials, this plausible deniability is invaluable at a time when self-identifying as a white supremacist is seen as impolitic.